A Vought F7U-3 Cutlass, assigned to the Naval Air Test Center, is prepared for launch aboard USS Coral Sea. 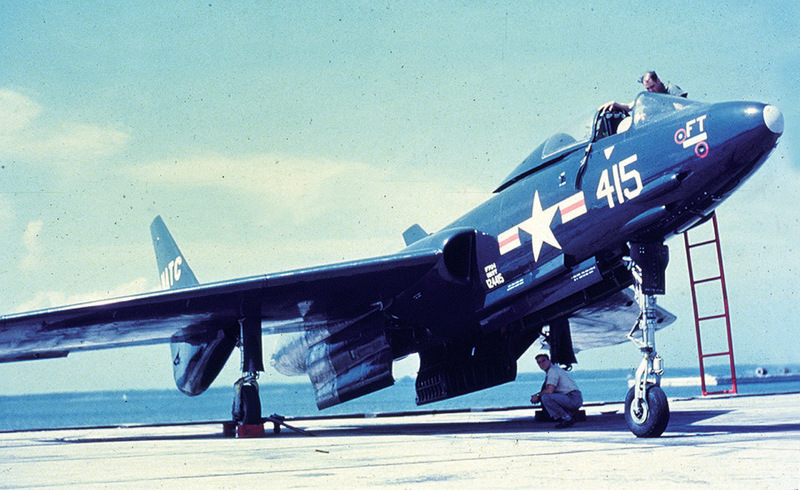 To Navy pilots in the early 1950s, the sweptwing F7U Cutlass looked like a fighter of the future, but they soon learned looks can be deceiving. When the Chance Vought F7U Cutlass first entered U.S. Navy service in July 1951, the tailless, sweptwing jet fighter seemed to represent a leap into the future. The Cutlass turned a lot of heads with its radical design, said to have been partially based on data captured from the Germans at the end of World War II. It was America’s first tailless production fighter, and the first airplane designed from the outset to use afterburners. The F7U featured hydraulically powered controls, an “artificial feel” control system and a steerable nose wheel. It was also the first fighter to catapult from a carrier with nearly 2½ tons of external stores and weapons. The new Navy fighter’s prospects seemed bright, but various technical and handling problems conspired to cut its service career short. More than one-fourth of the 300-plus airframes built were destroyed in accidents, many of which were attributed to unreliable engines that generated insufficient thrust. In the end, the F7U would cost the Navy four test pilots and 21 regular pilots killed, earning it such uncomplimentary nicknames as “Gutless Cutlass” and “Ensign Eliminator.” Yet in the hands of a skilled pilot who was aware of its limitations, the sweptwing jet performed well, and some suggested that its failings could have been overcome with additional developmental work, as would be the case with Vought’s F8U Crusader. Vought began working on the design just a few weeks before World War II ended. Navy officials had issued a request for a fighter that could easily operate at 40,000 feet and reach speeds approaching Mach 1. The XFU-1 logged its first flight on September 29, 1948, and subsequent test flights yielded some impressive results. The Cutlass was capable of carrying two 2,000-pound bombs on its inner pylons or 1,000-pounders on the outer pylons. It could also carry up to four AAM-N-2 Sparrow air-to-air missiles and was armed with four 20mm cannons. Final testing showed that the F7U could haul its weight in ordnance for ground-attack missions, and would also be a viable threat in the air-to-air arena. As a result, the Navy placed an order for 14 F7U-1s. Lieutenant Don B. Shelton, who had flown F4U-5N Corsairs with Navy composite squadron VC-3 during the Korean War, was one of the most experienced pilots to fly the Cutlass. He was among the test pilots who took part in Project Cutlass at Naval Air Station Miramar in San Diego, gathering operational information prior to the improved F7U-3 joining the fleet. This elite group included Floyd Nugent, Van Biesbrock, Burt Shepherd, Don Christianson and future astronaut Wally Schirra. Commander James “Bud” Brown headed the project. The extensive test flights, during which the Cutlass’ many quirks were explored, demanded much of each pilot. Although the sweptwing fighter’s sleek look lent it irresistible allure, the F7U-3’s flying characteristics and overall performance resulted in some scary moments. The ST unit’s job was to put as many service hours on the Crusader as possible and assess its ability to be maintained during fleet operations. Shelton submitted a preliminary report right after leaving the ST that gave the F7U-3 a “thumbs-down” and strongly stated that early results indicated the fleet would be unable to satisfactorily maintain the aircraft. He received a lot of pressure from higher command to change the report, but he refused. Pax River’s flight test director, Commander Heber Badger, backed him up, and Shelton’s honest evaluations would later prove to be right on the mark. One of the toughest prob­lems the pilots encountered during testing was the Crusader’s nasty stall characteristics. Only a very small number of pilots were author­ized to experiment in this area, and although Shelton had been pushing the dash-3 up to the stall point, he wasn’t permitted to take it further. “For several flights, I had made a few gentle approaches to stall in the clean configuration,” said Shelton. “At that point, I just relaxed the controls and let the aircraft fly out of the approach to stall. I did not like what I was experiencing in terms related to classic stalls. Knowing I was not allowed in this area, I called a friend in Flight Test who was very knowledgeable about the Cutlass and related to him what I had been experiencing. Not once had I popped the stick forward in the approach to stall, but rather let the aircraft sort of wallow out of it. In looking back over his years test-flying the F7U-3, Shelton vividly recalled several incidents. “One of these involved Po Harwell on his first flight being chased by Wally Schirra,” he said. “They took off from Moffett. When Po barely got over the bay at the north end of the field Wally told Po he was on fire and to eject. Total flying time was approximately one minute. Then there was an ensign from VF-151 on a tactics hop who maneuvered into an accelerated stall and the post-stall gyration ensued. For some reason he did not apply the correct recovery technique and ejected. Of all the jet designs on the drawing board in the late 1940s, the F7U appeared to hold the greatest potential for supersonic flight—it just looked fast, even on the ground. But despite its twin engines, the Cutlass possessed too little thrust and too much bulk to break the sound barrier. Above 30,000 feet, it could reach approximately Mach .98 or .99 in level flight with afterburners, and in a power dive with full afterburner the Mach meter would prob­ably indicate 1.0, but that was about as far as it got. The entire reason for the Cutlass’ being was its armament and ordnance capabilities. “Armament for the F7U-3 consisted of four 20mm cannons mounted above the engine intakes, an attachable rocket pack and external stores carried on the wing pylons,” explained Angle. “The cannon design had caused engine flameout problems, which the experts thought had been solved before VF-124 received the Cutlasses. Vents had been installed in the fu­­selage above the cannons to prevent propellant gases from being sucked into the engine. Later, an additional fix consisted of installing large lips along the bottom edges of the engine intakes. We had limited gunnery practice, firing on towed banners, and we experienced no flameout problems. The lips probably reduced top speed slightly, but we did not notice any changes. With Cold War tensions on the rise during the early 1950s, any new American aircraft was expected to be capable of carrying sophisticated “special” weapons. The ability to deliver nuclear weapons was no longer limited to the big bombers flown by Strategic Air Command. Carrier-based attack aircraft had come of age and were prime candidates to add this capability to their resumes. The Cutlass was no exception. Angle explained: “Our aircraft were equipped with the technology to arm a nuclear weapon in flight and to deliver it either during a half-loop starting at ground level or during a vertical dive starting at high altitude. The long main landing gear struts provided adequate ground clearance for the size of bombs we were to carry. A primitive computer system with a panel display similar to an ILS [instrument landing system] display guided the pilot and released the weapon in a half-loop delivery. The technique involved flying at about 50 feet above the ground at maximum speed, then pulling up into a 4G loop over the target.” Fortunately, no pilot ever had to perform that “toss-bombing” maneuver in combat. On the surface, the futuristic Cutlass appeared to pos­sess all the necessary traits to make it a great fighter. But its anemic engines, poor carrier takeoff and landing performance and the numerous accidents it suffered eventually signaled its death knell. The Blue Angels briefly flew two F7U-1s as a side demonstration during their 1953 shows, but the jet’s fanfare would be short lived. The Cutlass was retired from service in March 1959, replaced by a far more capable Vought fighter, the F8U/F-8 Crusader. Frequent contributor Warren Thompson specializes in military aviation from World War II through Desert Storm. For additional reading, he recommends: Chance Vought F7U Cutlass, by Steven Ginter; and Chance Vought F7U-1 Cutlass, by Tommy Thomason. Vought’s Visionary Fighter appeared in the September 2016 issue of Aviation History Magazine. Subscribe today! Want to build your own Cutlass? Click here!